I just got an e-mail highlighting somebody's Christmas single that features a kazoo solo. Jesus Christ, people. Not every idea that comes into your head is a good one. 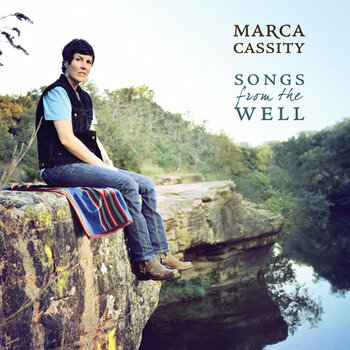 Marca Cassity's fourth independent release, "Songs from the Well" is a tribally-funded collection of 11 folk rock spirit songs, that delivers a positive message with Native nuances that speaks to overcoming hardship through resilience, in connection to nature, humor, love, compassion, spirituality, and heritage. The album, recorded at world-renowned Bay area based Fantasy Studios, and produced by Julie Wolf (Indigo Girls, Carly Simon), features guitarist Adam Levy (Tracy Chapman, Norah Jones), bassist Paul Olguin (Mazzy Starr) and drummer Dawn Richardson (4 Non Blondes). For this recording, Marca Cassity was honored to have been recognized by the Osage Nation with a tribal artist grant. The grant provided half of the funding for the project, and the remaining funds came from contributions by fans and supporters through Indiegogo. Growing up on the Osage reservation in Oklahoma, Marca learned early on about resilience through struggle and persecution. Born a two spirit Indian of mixed heritage in the midst of a blue collar bible belt, Marca’s youth was filled with life challenging adversity. Ostracized, and having outgrown her small town, Marca set out on her life’s journey, studying with spiritual teachers and musicians from around world, eventually becoming a trauma nurse and later a trauma specific counselor for Native American families in San Francisco. The album title “Songs from the Well” was inspired by a cousin’s near death vision of a box of unrecorded songs written by Marca that she found in the well house on their Osage Great-Grandmother's land. Thirteen years after her cousin’s vision, Marca sifted through her song catalog to record this album, and realized these eleven tunes were the songs from the well. The well that allowed her to return full circle, home, and back to her roots. At worst, these songs highlight Cassity's own spiritual evolution and the strength she clearly gives to others. She truly bears her soul in these songs, and not in the sense of the usual self-hating, confessional soul-bearing on this blog. The depth and maturity in her storytelling gives us a glimpse into a courageous and grounded human's heart. At best, we're all better for getting to know Cassity for 45-ish minute duration of Songs From the Well. The album is nothing less than uplifting.